A pair of new dramas replacing ABC's canceled Last Resort and 666 Park Avenue highlight the network's midseason renovations. CBS also is tinkering a bit while NBC and Fox earlier announced their planned makeovers. 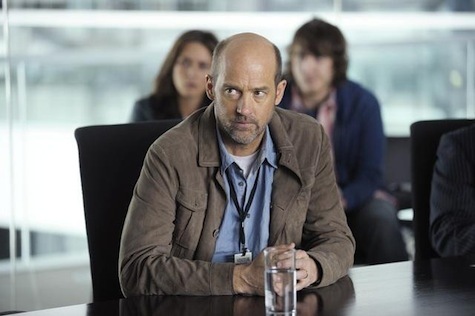 ABC's Zero Hour, starring ex-ER mainstay Anthony Edwards as a myth de-bunker thrown into "one of the most compelling mysteries in human history," is slated for a Thursday, Feb. 14th premiere in the 7 p.m. (central) slot currently held by Last Resort. Red Widow, which depicts "one woman's journey into the world of organized crime," lifts off on Sunday, March 3rd with a two-hour premiere. It will then settle into the Sunday, 9 p.m. slot of 666 Park Avenue. Radha Mitchell (Silent Hill) stars, with scripts from Twilight Saga writer Melissa Rosenberg. ABC also has two new sitcoms coming. The elongated How to Live with Your Parents (For the Rest of Your Life) finds Scrubs alum Sarah Chalke moving in with eccentric parents played by Brad Garrett and Elizabeth Perkins. It premieres on Wednesday, April 3rd. Family Tools stars another familiar TV face, Leah Remini (King of Queens), in an alleged laugher that "proves mixing family with business is never easy." Launch date isn't until Wednesday, May 1st. ABC's The Taste, a cooking competition with chefs Anthony Bourdain, Nigella Lawson, Ludo Lefebvre and Brian Malarkey, is set to fire up on Tuesday, Jan. 22nd with a two-hour premiere. And Celebrity Diving takes the plunge on Tuesday, March 19th, with Greg Louganis and 2012 Olympic champ David Boudia trying to teach novices how to make a splash. Celebs haven't been announced yet, but I'm liking the idea of Wayne Knight doing a cannonball. Wait, there's more. ABC's Body of Proof is scheduled to return on Tuesday, Feb. 5th while Dancing with the Stars will start hoofing and puffing for a 16th time on Monday, March 18th. ***The CBS changes are far less eventful. Its lone new midseason series is Golden Boy, a crime drama starring Britisher Theo James as the youngest police commissioner in New York City history. After a pair of sneak previews on Feb. 26th and March 5th, Golden Boy will move to Fridays alongside Blue Bloods, starring Tom Selleck as one of the oldest police commissioners in New York City history. CBS says that CSI: NY will have its Season 9 finale on Friday, Feb. 22nd before Golden Boy takes its spot on March 8th. Rules of Engagement, CBS' all-purpose putty, will return anew on Monday, Feb. 4th in the 7:30 p.m. slot occupied by Partners until its cancellation. Two long-running CBS reality-competition series, Survivor and The Amazing Race, respectively will return for editions 26 and 22 on Wednesday, Feb. 13th and Sunday, Feb. 17th. ***Fox has announced the so-called stars for its diving competition. Unlike ABC's, though, Stars in Danger: The High Dive mercifully will be just a two-hour special rather than a weekly series. Poor Terrell Owens is among the eight participants. Also included: Jennifer Farley (JWoww from Jersey Shore, Bethany Hamilton, Alexandra Paul, Kim Richards, Kyle Richards, David Chokachi and Antonio Sabato Jr.